Liu Wei was born on 1972 in Beijing, China. He lives and works in Beijing, China. Liu Wei's practice is uniquely varied. Working in video, installation, drawing, sculpture, and painting, there is no stylistic tendency which ties his work together. Rather Liu perceives the artist's function as a responsibility of unmitigated, uncensored expression, tied to neither ideology nor form. Throughout Liu's work lies an engagement with peripheral identity in the context of wider culture; his works often describe a sentiment of excess, corruption, and aggression reflective of cultural anxiety. Liu's sculpture Indigestion II is a monumental poo. Spanning two meters, it's a man-sized statement of rejection. Crafted with comic exaggeration, Liu's turd is both repulsive and compelling; leaving no detail to the imagination, Liu offers 'too much information' in the details. On closer inspection, half digested kernels emerge as hundreds of toy soldiers, spilling forth in an unmistakable sentiment of protest. 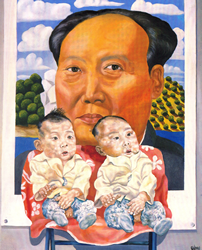 Conclusions: Liu Wei had already established his own style and the impact of the work had won him a strong reputation in Chinese art circles. Liu Wei was born on 1972 in Beijing, China. He lives and works in Beijing, China. Liu Wei's practice is uniquely varied. Working in video, installation, drawing, sculpture, and painting, there is no stylistic tendency which ties his work together. Rather Liu perceives the artist's function as a responsibility of unmitigated, uncensored expression, tied to neither ideology nor form.